The rare Cobra Lily is a one-man wolf pack (…snake pack? ), the only one species within its genus. It is native to regions of Southern Oregon and Northern California. 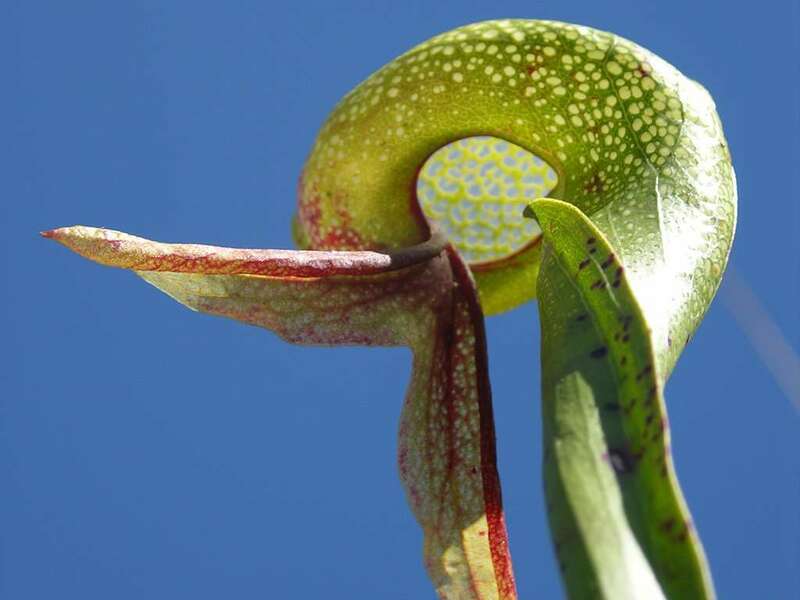 Darlingtonia californica is closely related to other Sarracenia pitcher plants, but it exhibits unique physiological differences from its cousins. 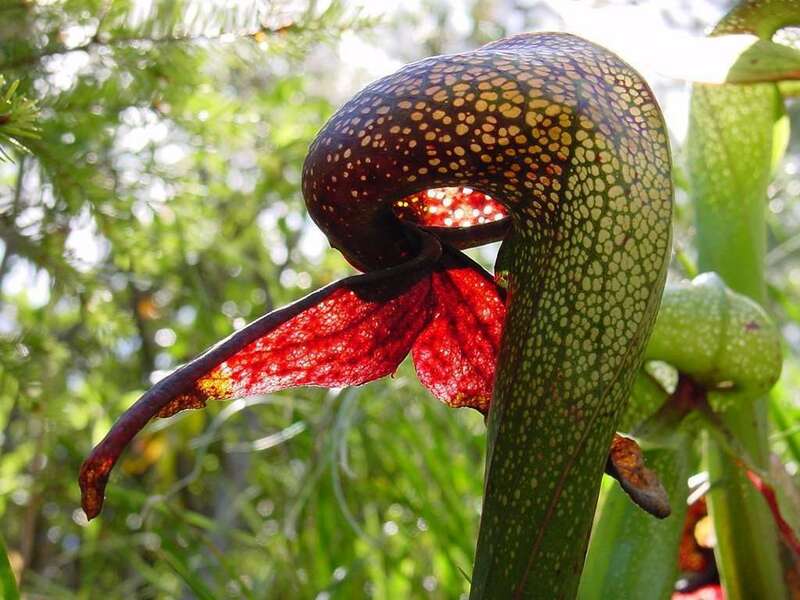 The Cobra has an unusual broad curved head of the pitcher, which opens downward, unlike all the other pitcher plants; this, combined with the pointed forked leaf at the mouth of the plant gives the plant an undeniable resemblance to the famous hooded snake for which it gets its name. Apparently this isn’t enough to scare off insect, because Darlingtonia californica is a voracious insectivore. Cobra Lilies use all the same tactics of traditional North American pitcher plants with pitfall traps (e.g. nectar, red coloration, sharp downward-pointing hairs that guide insects to their doom, and slick waxy surfaces), but they have a few additional tricks up their leaves. The most distinctive Cobra Lily trait has to be the forked “tounge” dangling from the trap’s “mouth.” This tongue secretes intoxicating nectar with the highest concentrations found where tongue meets the trap’s opening – an obvious invitation to crawl inside. Transparent blotches cover the “head” of the trap like tiny port holes (which also resemble scales), so when a bug gets trapped inside the bulbous hood, it becomes confused and unable to find the exit. Numerous failed attempts to escape through the false exists cause the exhausted bug to stumble and fall into the trap. Unlike its close cousins, the Cobra lily does not produce digestive enzymes, but rather secrets water that drowns a bug and promotes bacteria and microorganisms to break down soft tissues for absorption – similar to how human large intestines leverage the beneficial bacteria in our microbiome to digest food. 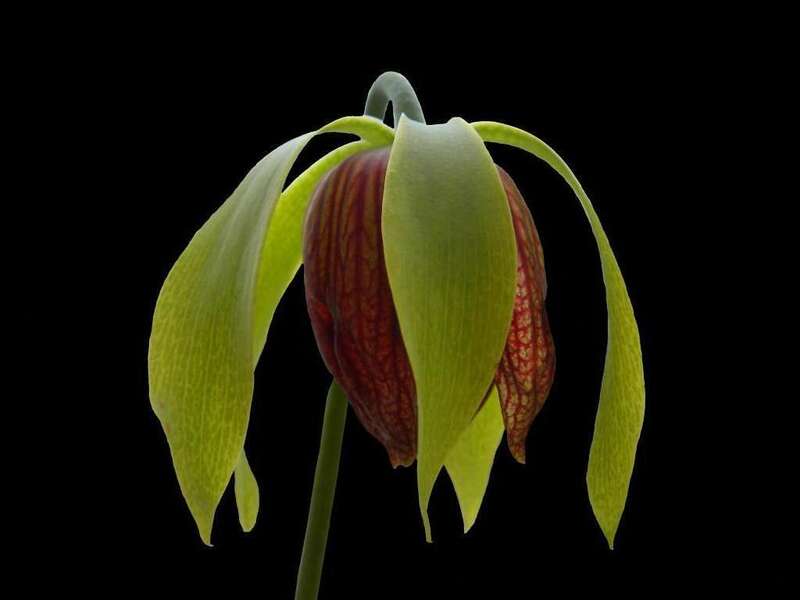 Darlingtonia are most commonly found at sea level by the coasts of Northern California and Southern Oregon. They will grow up into the central mountains, but in all conditions, their roots produce long underground stolons and are exposed to cool, slow-moving water. Keep roots cool, especially during summer nights, to keep Cobra lilies happy. The need for cooling water is a lesson learned the hard way by your dear author. Living in hot Southern California, I have fried my share of Cobra lilies – exceedingly unfortunate as they now carry a “threatened” label due to habitat destruction. If temperatures get too hot, use refrigerated water and water the plants from overhead, cooling down the roots. Ice cubes left on the soil’s surface can also help. If given the right conditions, Darlintonia californica will send out long stolons, or runners, that creep underground and pop up as new plants feet away from the parent. These stolons are a reliable source of cuttings for Cobra propagation. We cover that, below. Cobra Lilies produce flower buds at their base in winter, and launch 1-to-3-foot-tall flower stalks come warmer spring weather. The singular flower dangles upside down where green sepals unfold from the bud. Beneath the sepals are red petals fuzed until their ends where an opening invites pollinators fortunate enough to not be food… yet. 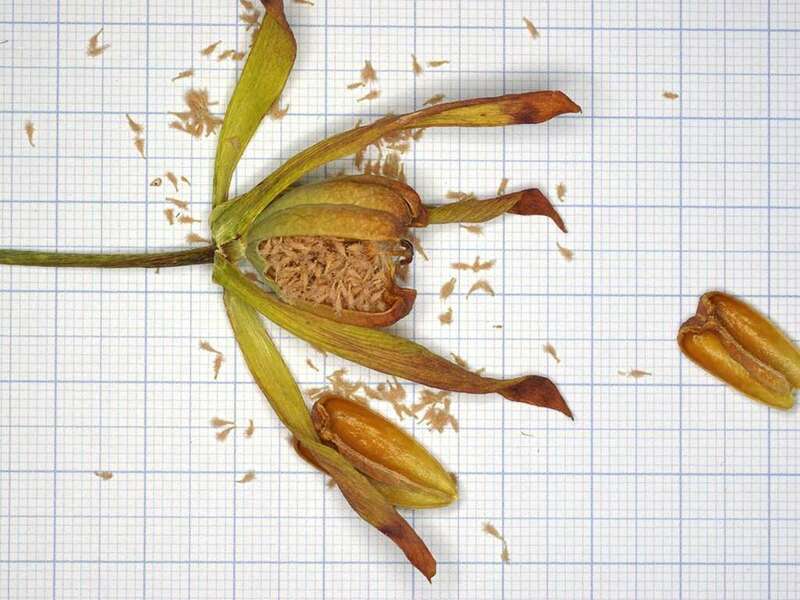 To ensure a good seed set, hand pollination is key. Do so by separating the petals and inserting a small paintbrush with which to collect pollen from the anthers. Deposit the pollen onto the star-shaped stigma towards the bottom of the flower, at the end of the ovary. Two or three months after pollination, the ovary will crack open to release viable seed. Collect the small fuzzy seeds and store them in refrigeration until the following February when you should sow them. Darlingtonia californica’s discovery had a bit of a rough start when first identified on an expedition in 1841 by botanist J.D. Brackenridge south of Mt. Shasta, California. Brackenridge was on an expedition, as botanists frequently are, when he came across the curious plant. Immediately upon collecting a specimen, his expedition group had an unfriendly encounter with the region’s Native Americans that forced an early retreat. While expeditiously fleeing the scene, arms full of plants, he noticed a curious detail – a persistent butterfly chasing the moving cobra heads. In 1853 John Torrey described the plant and named it after his friend Dr. William Darlington. 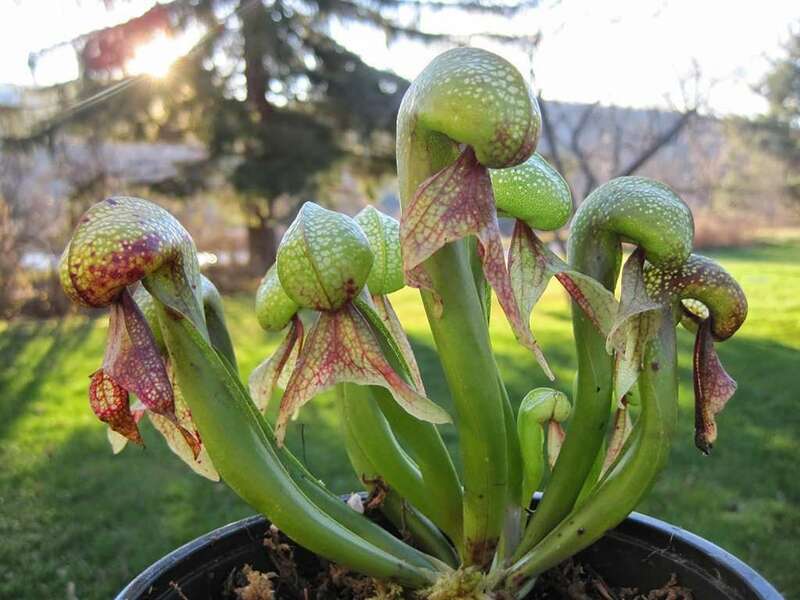 You’ve probably guessed that, with a name like Darlingtonia californica, these plants grow in California. Bingo! 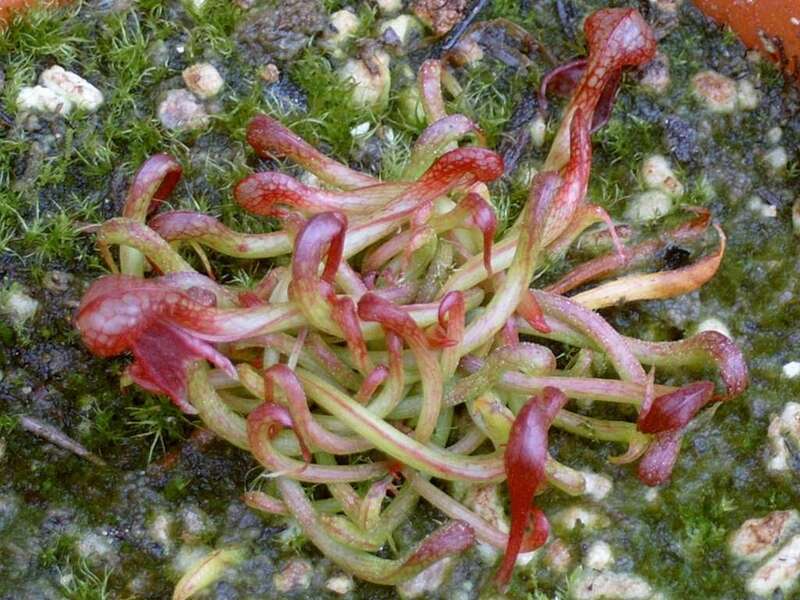 Find them along the coastal sphagnum bogs of Northern California into the Southern regions of Oregon. They stretch inland in Del Norte County from the Smith River basin down to Humboldt County. 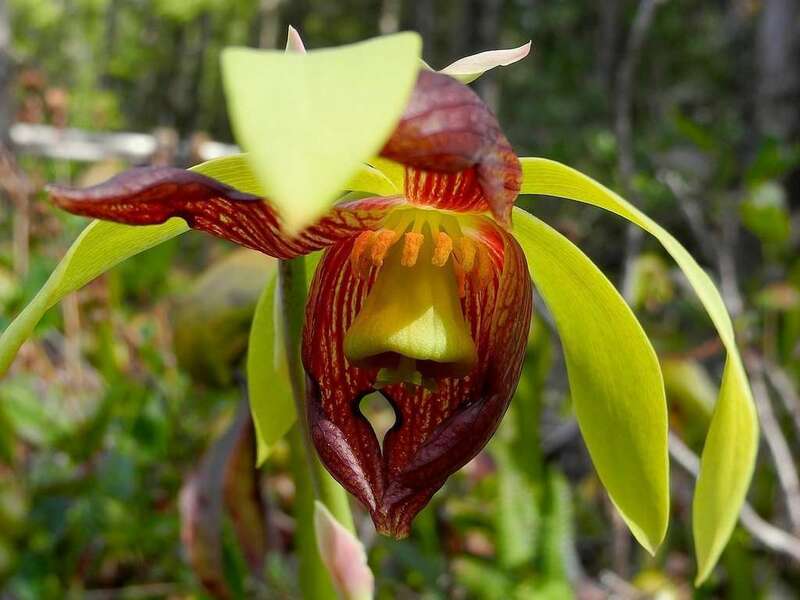 Even farther inland, you’ll come across Cobra lilies by Mt. Shasta, the Trinity Alps, and Klamath mountains all the way through to Sierra Nevada. You want to maintain an airy soil to maintain cool root temperatures. Use one part perlite to four parts long-fibered sphagnum moss or one part lava rock, pumice, and perlite to four parts peat. Use drained containers of a light color to reflect light, and minimize heat absorption (keep the roots cool!). Plastic pots, terra-cotta clay, and glazed ceramics all work. Mature plants do well in larger 12-inch pots that provide room for stolon growth. Wee cobras with pitchers shorter than 4 inches will be comfortable in 4-inch pots. Use cool, distilled or reverse osmosis water. This can be inexpensively purchased in most grocery stores, or you can invest in a reverse osmosis (RO) filtration system that hooks up to a sink (bonus – this also provides great drinking water for humans and pets). I recommend refrigerating distilled water to cool it down further. Keep the plant in a water tray but water from overhead to flush the roots with cool-to-cold water. Deploy ice cubes on the soil’s surface if temperatures get too hot. Always be thinking that this plant grows alongside cold streams in nature and happily deals with snow during the winter. Full sun to part shade. Brighter light will encourage more vibrant red coloration in Cobra pitchers. There’s a balance, though, as you also need to keep the plants cool and shaded in warmer climates. Darlingtonia are a little trickier to hand feed than most pitfall-type carnivorous plants due to the upside-down entry point to the trap. Use forceps to sneak up, and drop in dried insects, crickets, and sow bugs. Outdoor plants should do a good job of catching live bugs. 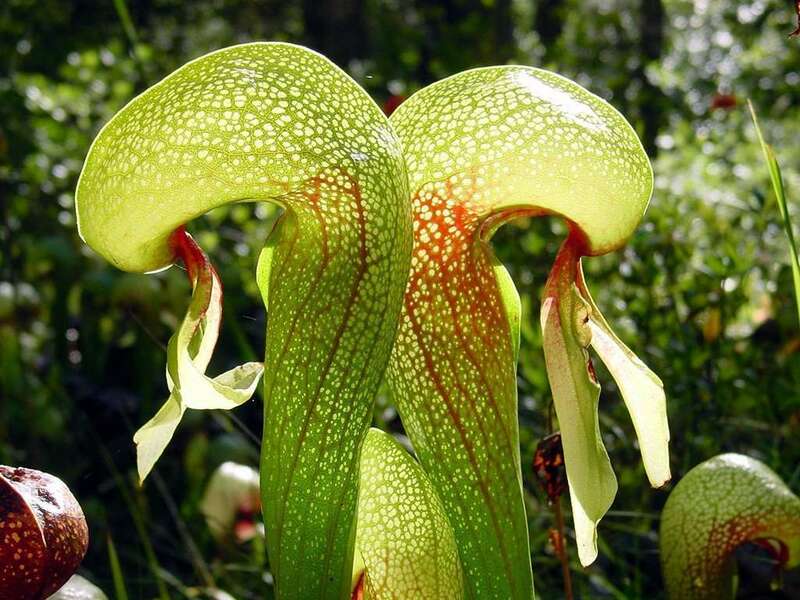 Like most carnivorous plants, Cobra lilies grow naturally in nutrient poor soils – a major reason why they evolved traps to catch insects as their source of nutrients. 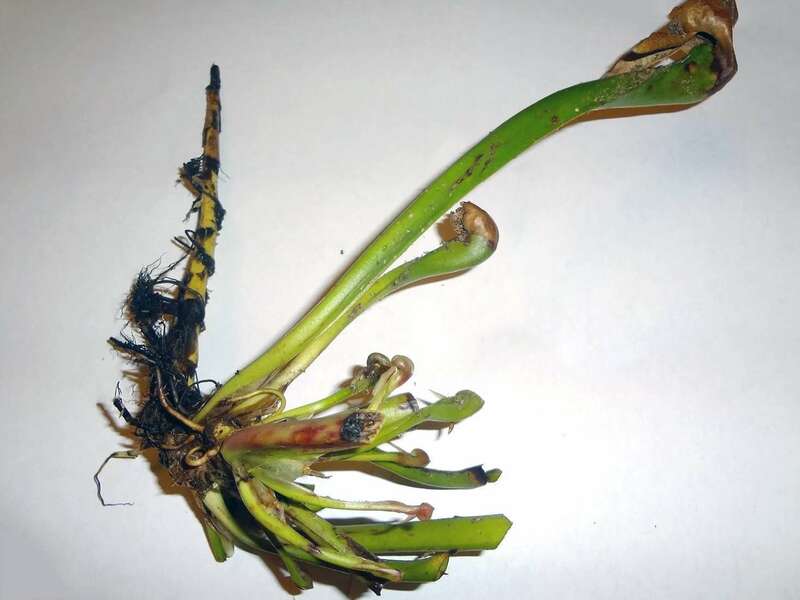 If not carefully handled, fertilizing can burn roots and kill the plant. Advanced growers use an acidic 30-10-10 (NPK, or Nitrogen-Phosphorus-Potassium)Orchid fertilizer or Maxsea to foliar-feed plants (applying it only to the leaves of the plant) once a month during the growing season. Divide and transplant in later winter, during but towards the end of dormancy. 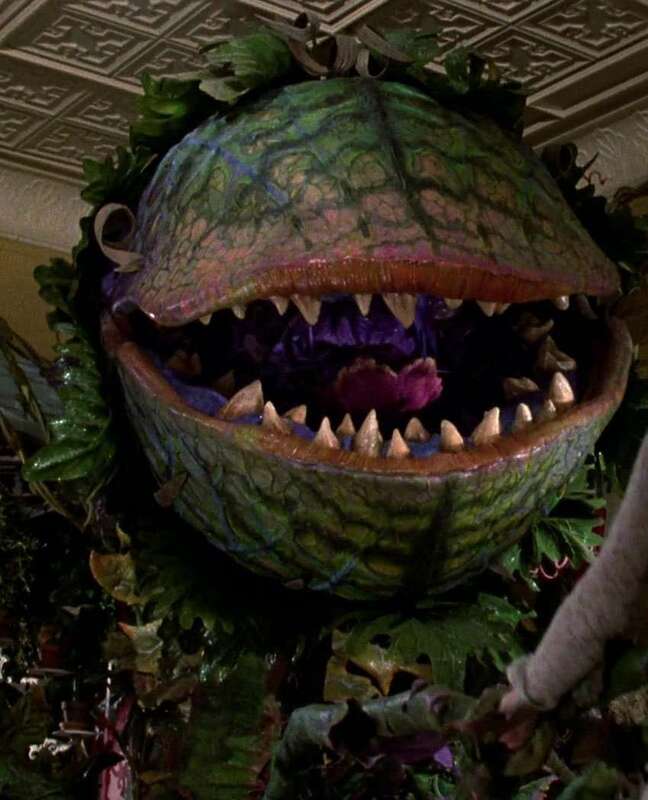 Remember that the plants enjoy extra room in their pots to send out stolons that may reward you with even more new plants! Divide clumping Darlingtonia to encourage new growth during winter dormancy. Each separate growth point needs a root system to sustain healthy leaf formation. Plant up the divided plants just as you would during a normal transplantation. 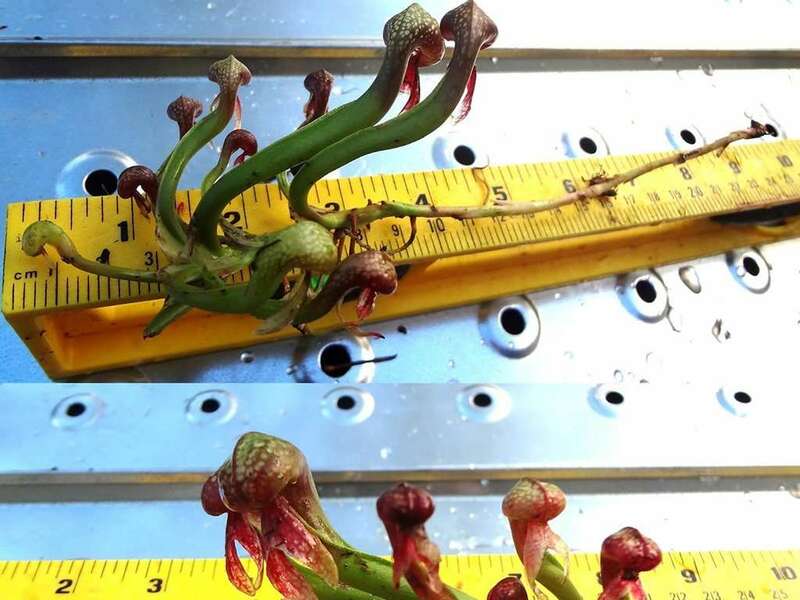 Stolon cuttings are the way to go with Darlingtonia and result in larger plants, faster, as compared to seed-grown plants. During the repotting process, tease out those stolons that have wee-baby Cobra plants at their ends. This is an indication that you have a healthy, viable stolon that can be removed from the parent plant in 3 to 6 inch sections and potted up. Make sure each section of stolon has a few healthy roots, and lay them horizontally on a bed of sphagnum moss in a drained pot or seed tray. Keep humidity levels high with a humidity dome or plastic bag, and maintain cool temperatures with refrigerated water. 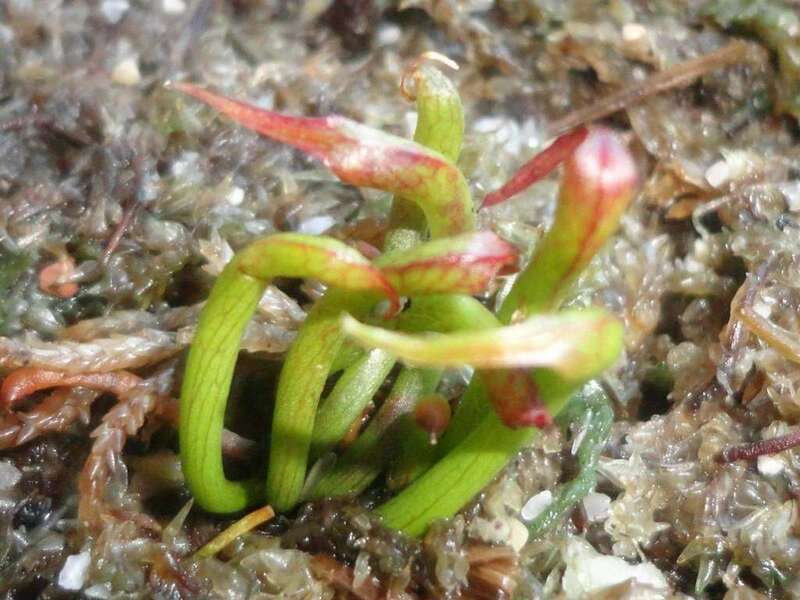 Wait a few months, and you will have small pitchers growing from the stolon cuttings. Keep your collected seed refrigerated until the following February. Sow the fuzzy seeds in long-fibered sphagnum moss and stratify them for a couple of months in damp, chilly conditions. With the onset of warm spring weather, the seeds will germinate and sprout into cute baby Cobra plants. It’s worth mentioning that Cobra lilies started from seed will grow very slowly, only reaching 3 to 4 inches after 3 years. The faster propagation method is via stolon cuttings. Cobra lily seed can be used for in vitro tissue culture. Thrips, mealybug, and scale are the most common pests while aphids and caterpillars chomp on newly-formed leaves that have yet to harden off. 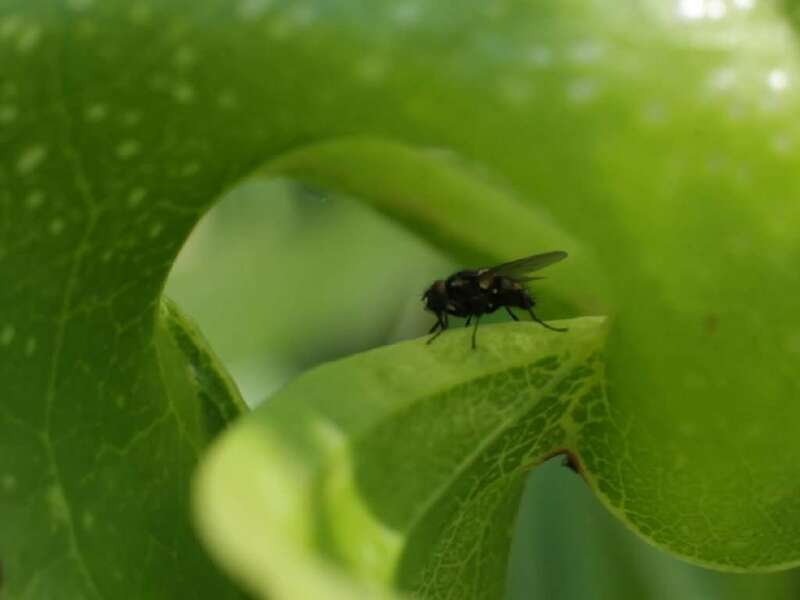 Canola oil and pyrethrin treatments can be applied to eradicate these annoyances.In some cases, powdery mildew will form blotchy purple spots on cobra pitchers. Fungicides like Physan or Serenade will control these. Avoid all copper-based fungicides. Following a mostly Mediterranean climate, warm summers and cold (even snowy) winters are the norm with a required winter dormancy. Unlike some other carnivores, the Cobra traps may remain into the next growing season. Year-round cool evenings are needed. Cobra lilies grow well in Mediterranean-like climates where nights stay chilly. Great coastal candidates in their home states of California, Oregon, and even up into Washington – just make sure they don’t bake in the sun. Water with cool water frequently, and use a turkey baster to recirculate tray water. They do well in cold houses, cool houses, and warm houses, and in cold frames in warm-temperate climates. Evenings should drop below 65 degrees Fahrenheit in the summer. Not great terrarium candidates due to size and temperature requirements. You can keep small plants in terrariums as long as conditions stay cool. Place Cobra plants in a cold environment for winter dormancy. Darlingtonia do ok in partly sunny windowsills, but flush plants frequently with refrigerated water. Use the ice cube method to keep roots cool on hot days. Move the plants to colder conditions for winter dormancy. Good candidates for bog gardens as long as the outdoor climate mimics the Cobra lily’s natural habitat. Bog plants do well in northern latitudes like New England, the Great Lakes, or northern Europe.